How does USBSecure Professional 4.3 work? USBSecure Professional runs as a service on Windows Vista, Windows 7, Windows 8/8.1 and Windows 10. 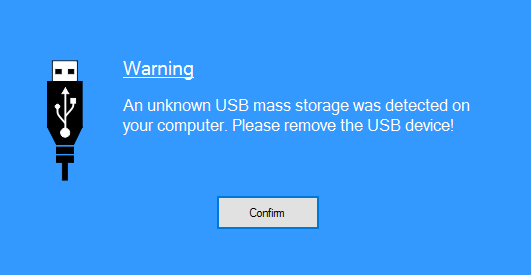 You can define the users who are able to use certain USB devices. As the service starts – when booting up – the current configuration files will be downloaded from the server. The configuration files contain user-based information (Active Directory or local users) for enabling or disabling USB devices, FireWire ports, eSATA devices, SD cards, floppy and CD/DVD drives. To enable a complete group of devices – e.g. non-critical devices like USB mouses, keyboards or scanners – for all users, you need to place just one entry in the central USB config file usb.cfg in the AllUsers section. You need the VidPid identifier to enable only a single USB device. This identifier is listed in the USBSecure logfile or can be retrieved by executing the provided script „ShowExistingUsbDevices.vbs“. Alternatively you can get the VidPid identifier directly from the device manager. The VidPid identifier must be entered below the user name of the corresponding user. You don’t need a dedicated server for USBSecure Professional. An existing Windows server can be used – you just need a Windows share devices$.